If you want your shop's visitors to buy things, you'll first need to add at least one product. You can add up to 5,000 products in your Online Store. You can bulk upload no more than 100 products at a time. While you can add or import products to your store, there's no export option. When your store appears, click Manage Store. Start by entering a Product name. Click Add Image, browse to a product image, and click Open. Note: Images must be formatted as .jpg, .jpeg, .gif or .png files. They cannot be more than 10MB each. (You can upload images that are up to 5000 by 5000 pixels. But they will not be displayed larger than 1920 by 1080 pixels.) Images of at least 600 pixels in one dimension will enlarge when your customer's cursor hovers over them. You must enter a Price, then fill in the remaining fields as needed. Tax Category If the product's taxable, leave the menu set to Standard. Otherwise, change it to Non-taxable. SKU Enter a unique SKU (Stock Keeping Unit) number to track your inventory and manage related invoices. You can use any numbering scheme you like. Visibility Uncheck if you want to hide seasonal items or when you plan to roll out multiple products simultaneously at a later time. 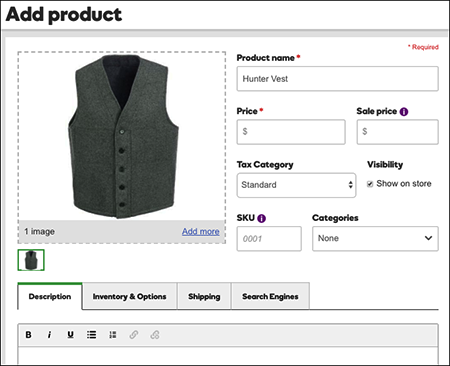 Categories You can make it easier for customers to find items by creating categories, such as clothing, housewares, toys. For more on creating subcatories, see Add product categories. Description Add info about product, such as how it's made or used. Inventory & Options Use this tab to track available supplies and offer customers product choices, such size and color. Search Engines Use to have your product display a specific title and description when it appears in search results. Click Save when you're done or click Save and Add Another to keep adding products. To make your changes live, publish your site. how do i add amazon products for amazon associates to my website?